The lecture was about to start and I knew how long it would take me to bike to Ilam campus from Avonhead. I biked past Dovedale campus and then along Ilam Fields. As I got to the Ilam Road crossing I saw a car coming, which I thought would stop for the crossing. I slowed but didn’t stop and entered the crossing. Pretty much as soon as I entered the crossing I knew the car hadn’t slowed down enough to stop. I was the only one on the crossing and I remember the car vividly, it was coming towards me and it was getting so close, freakishly close. I knew the car was going to hit me. I don’t really remember the car hitting me, but I remember lying on my back on the ground and feeling my legs tingling and an odd sensation. I felt extremely winded and could feel pressure on my left side. Security staff told me later that I had jammed on my brakes, put my foot down and I braced myself for the impact. I was hit on the crossing but landed a few metres away on the road. I was just taken along with the car as it was moving. I was wearing my helmet – so glad that I did. A whole chunk of it broke off. The ambulance guys told me if I hadn’t been wearing it, I would have been knocked out. It happened so quickly – in a couple of seconds. I was lucky there wasn’t a car coming from the other direction. I just lay on the ground for a couple of minutes afterwards and closed my eyes – possibly in denial! I think I was in shock. I think the driver who hit me was in shock too. Heaps of people came to help me, and the security team were really fast at calling an ambulance and getting all my stuff together. I had bruising on my ribs from where the car hit me, and bruises and cuts from the road on my legs – I was lucky. Because I was on a bike I was elevated, if I was a pedestrian I would have been bowled over. I sent a text to my friend afterwards and told her what had happened. As you can imagine I got a quick reply. She took me home – driving very cautiously! I never did get to the lecture. My ribs took the longest to heal, they took most of the impact and were quite uncomfortable for a while. I think it took me a week to understand everything that had happened. I’m definitely more cautious now and a lot more aware of what’s happening around me. I don’t take the same risks, it’s just not worth it – it’s better to be a couple of minutes late and to get there safely in one piece. If you do take a risk you’re putting yourself and other people in a vulnerable position. You’ve got to put yourself in the other person’s shoes. Imagine being the driver, they don’t want to hit a cyclist or pedestrian just as much as you don’t want to be hit. 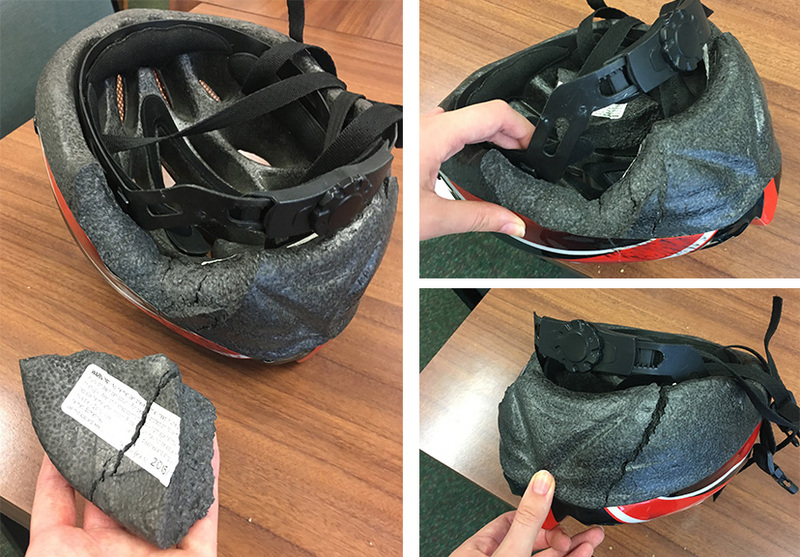 Below: The damage to Victoria’s bike helmet. bikebike safetycyclistsHealth and safetyLook out for othersThink first.